About 2 years ago I started following one of these beautiful, skinny, blonde, raw vegan chicks on Instagram. She would post all these perfectly lit, professional, colorful, fresh, vegan meals and I would gawk at them like I was looking at a supermodel. Scrolling through her pics, I actually began to crave raw veggies the way one would crave a giant peperoni pizza. She was, and still is, the inspiration behind one of my absolute favorite and easiest go-to weeknight meals. Plus, it’s probably the healthiest thing that’s ever come out of my kitchen. These Veggie Spring Rolls couldn’t be any easier to make, any more satisfying to eat, and any more beautiful on a plate! Plus they take ZERO cooking time. All you have to do is prep + roll + chew! Now, I’m going to describe the quick and easy way I usually make them and I’ll leave it up to you to add as many ‘Could Haves’ as you want. Directions will be the same, flavors will be gorgeous!! 1. Chop all your veggies into julienne (matchstick) size pieces. This will make it so much easier to roll. 2. Warm up some water and pour in a large bowl. 3. Dip your rice paper in the warm water for 5 – 10 seconds just to soften a bit. Not too soft. 4. Lay your rice paper flat on a damp cutting board and lay your veggies, tofu, crushed peanuts, herbs, etc in a nice pile in the middle of the rice paper.Be careful not to overfill. 5. Roll it like a burrito. Bottom flap up, top flap down, grab one side, roll over to other side, tuck, roll, tuck, roll. And finally seal the other side. 6. I like to cut mine in half so I can see all the pretty insides and eat twice as much. 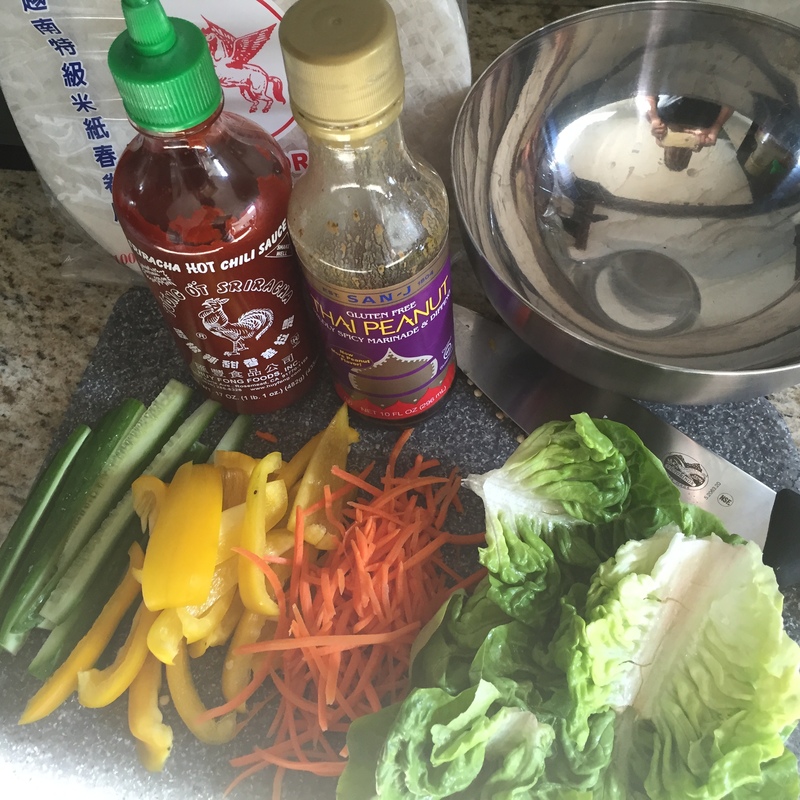 I did the calculations and these veggie rolls come out to about 100 calories each based on what you stuff them with and how hard you dip them in the sauce. That’s what I call The Pretty Girl Diet!